Toes can be painful because of boney or soft tissue problems. The most common boney problem is osteo-arthritis. Generally referred to as the wear and tear arthritis, will tend to affect joints on one side at first, most likely in hips and knees and to a lesser extent in the feet. Hands more affected before feet. Causes reduced fatty padding under the foot. Poor shock absorption of the joints needs to be supplemented with cushioning footwear. A podiatrist will help diagnose the difference between boney and soft tissue inflammation. Moulded insoles can redistribute pressure under the foot and relieve pressure form the mid foot area. Rheumatoid arthritis (R.A.) can affect any-one at any age. More likely to be female diagnosed when 30-40 years. Has definite genetic basis, and is an immune system response. Joints become swollen and deformed. 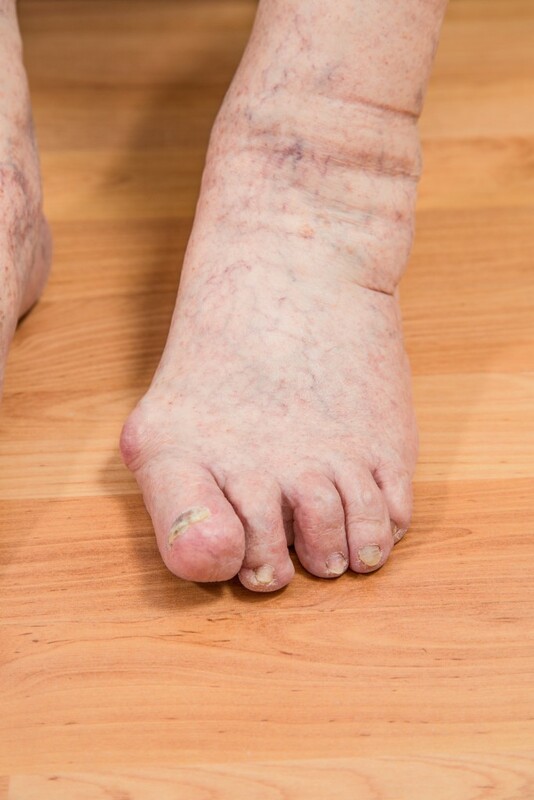 The ankle is often affected causing the foot to roll in and collapse, lesser toes become retracted and fatty padding is puled up under the toes. There are often nodules under the foot. Treatment is aggressive and needs to be early. At first hard orthoses will stop joint deformity, then softer accommodative devices are made to protect the nodules under the foot.